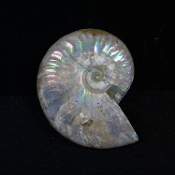 This Opalized Polished Ammonite measures 2 3/4 x 2 1/8 inches. Stand sold separately. This item ships free anywhere in the continental USA. This Opalized Polished Ammonite measures 2 1/8 x 1 5/8 inches. Stand sold separately. This item ships free anywhere in the continental USA. 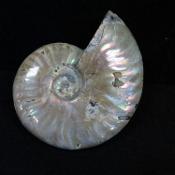 This polished Ammonite is 3 1/2 inches tall and 2 1/2 inches wide. Ammonites are related to squid and octopus. These marine mollusks died out in the Cretaceous Period (65 million years ago). Stand not included. This item ships free anywhere in the continental USA.